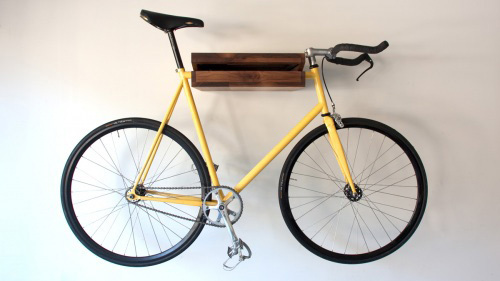 The Bike Shelf designed by Chris Brigham. Cool idea! 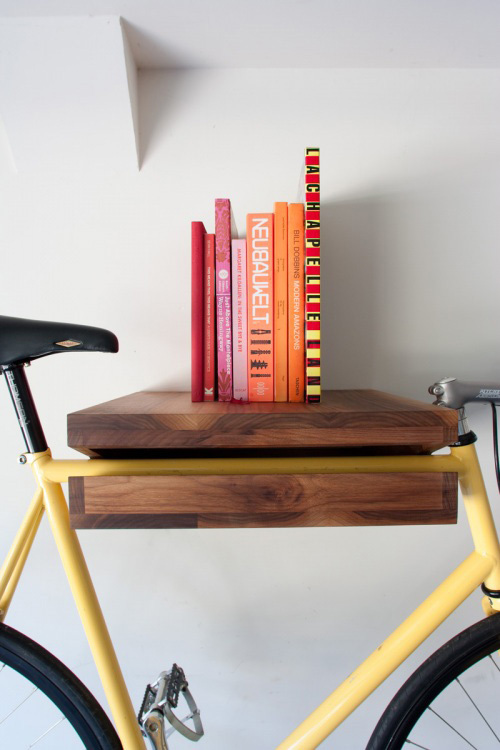 The Bike Shelf designed by Chris Brigham. Cool idea! You want one? You can email Chris to make one for you. "While visiting many friends small apartments here in SF and more so in NY, I noticed that there is a void when it comes to elegant bike management. Bikes always get in the way â€“ either in the hall, or leaning up against a bookshelf or something. So, I decided to design something to fix that problem. Until I think of a better name, I am calling it the Bike Shelf." "Mientras visitaba a muchos amigos aquÃ­ en pequeÃ±os apartamentos San Francisco y mÃ¡s aÃºn en Nueva York, me di cuenta de que hay un vacÃ­o en lo que respecta a la gestiÃ³n de lo que a bicicletas refiere. Siempre en el camino - ya sea en el pasillo, o apoyado en un estante o algo. AsÃ­ que decidÃ­ diseÃ±ar algo para solucionar ese problema. Hasta que piense en un nombre mejor, lo estoy llamando Bike Shelf ".